Somewhere between perfectly colonial, and timeless and chic - you'll find this beautiful Italianate Finger Lakes estate settled on the west side of Cayuga Lake. 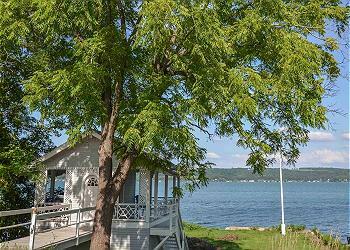 Centrally located between Seneca Falls and Ithaca you'll find yourself with an abundance of Finger Lakes fun right at your fingertips! Sheldrake House, built in 1850, is situated on 2 acres with sweeping views of Cayuga Lake and includes 200 feet of beautiful lakefront. It is nestled between two stunning examples of 19th Century American Architecture in a neighborhood distinguished by large parcels and extensive waterfront holdings, leading to a peaceful and private lakeside experience. As you pull into the estate, imagine enjoying a cool drink on the wrap around veranda or under the portico where the carriages used to stop. When you are ready to enter, choose between the side entrance to the Library or the front entrance to the Front Hall with its grand staircase. A formal living room with spectacular lake view is just through the doorway. Traveling further into the first floor you'll find the dining area; offering an understated table below a gleaming Waterford chandelier. The extended table makes mealtime easy and fun when you're with family and friends. Just off the dining area is a second living area with comfortable sofa and another large dining table. Borrow a book off the shelves from the library while you're here and escape into a novel world. Down the hall, discover the Italian style kitchen with beautiful cabinetry and counter tops. This "Cook's Kitchen" boasts stunning architectural design, and bursts at the seams with all of your favorite cooking and baking ware. Stop at the Ithaca Farmers Market and bring back fresh, brightly colored produce and add a Finger Lakes touch to mealtime. Located off the kitchen is a breakfast area with garden view where you can mingle with everyone busily working in the kitchen. In the back hall is a generous pantry, second refrigerator, and a half bath with shower. The second floor offers four of the five bedrooms and two full baths. Each bedroom is designed with floor to ceiling windows offering panoramic garden or lake views. The third floor tower is a quaint bedroom for one with the best views in the house. Consider yourself lucky if you've been able to scoop up this space during your getaway. Outdoor entertainment and relaxing is easy at Sheldrake House. Whether you're spending time on the new patio off the kitchen, enjoying the shade under the portico, or sitting on the veranda soaking up the views of Cayuga Lake, there is not a space at this home that won't capture your heart and create a fond memory! The lakefront of this colonial home is located just across the lightly traveled road. A cozy boat house offers a second floor with sheltered seating for 10, a refrigerator, and a raised view over the waterfront. The first floor has storage for chairs and lake toys, and a holds a canoe and two kayaks for use while staying at the House. Each day at Sheldrake House will be an adventure: whether you're running and playing in the yard, spending time in the cool waters of Cayuga Lake, or exploring the area around you. Visitors will find places like Taughannock Falls, Buttermilk Falls, the Cayuga Lake Creamery and Sheldrake Point Winery the perfect Finger Lakes treat! Call and make your reservation today! For larger families, book the Sheldrake Cottage located next door in addition to the Sheldrake House.